So just three days prior to his scheduled follow-up testimony before the Judiciary Committee, Supreme Court nominee Brett Kavanaugh sent a letter to the committee that represents a declaration of war not only on his sexual-assault accusers but on all his tormenters, including the Senate Democrats he will again face on Thursday. Gone is the calm jurist who did a lot of stonewalling in his earlier testimony, but didn’t lose his cool. Now, emulating many of his defenders, he’s going on the attack and presenting himself as the victim of “smears” and “character assassination” by people in a “frenzy” to defeat his confirmation. Only after that exhaustive process was complete did I learn, through the news media, about a 36-year-old allegation from high school that had been asserted months earlier and withheld from me throughout the hearing process. Horrors! Within a decade or two we might have a female majority on the Court! Kavanaugh’s resort to this raw fear of the loss of white male privilege is a sign that he’s staking his survival on a backlash from the Republican Party’s conservative base that stiffens the spines of GOP senators and keeps pressure on the two Republicans — Susan Collins and Lisa Murkowski — could actually kill his confirmation. But there’s another Republican Kavanaugh may be implicitly addressing in his letter: Donald J. Trump. I will not be intimidated into withdrawing from this process. The coordinated effort to destroy my good name will not drive me out. The vile threats of violence against my family will not drive me out. The last-minute character assassination will not succeed. In public, Trump continues to voice support for his embattled Supreme Court nominee, telling reporters at the United Nations earlier this morning that he stands with Kavanaugh “all the way.” But in private, Trump is growing increasingly frustrated by being mired in a deteriorating political situation beyond his control. On Monday morning, a Republican briefed on Trump’s thinking said the president has been considering pulling Kavanaugh’s nomination. According to the source, Trump allies are imploring him to cut Kavanaugh loose for the sake of saving Republicans’ electoral chances in the midterms. The argument these advisers are making is that if Kavanaugh’s nomination fails, demoralized Republicans will stay home in November, and Democrats will take the House and the Senate and initiate impeachment proceedings. The end result: Trump will be removed from office. “The stakes are that high,” the source said. Another Republican adviser told me: “Trump is very worried now, and is finally waking up that it’s the end of his presidency if he loses the Senate.” Trump’s outside allies are advising him to nominate Amy Coney Barrett and fast-track her confirmation before the midterms. Kavanaugh may well be making it clear to the president that he won’t take a bullet for the team and go away quietly — and that if Trump tries to withdraw the nomination, he’ll be exposed to his own electoral base as a loser and a coward, unwilling to fight the character assassins. If the judge maintains this posture he may succeed in freezing Republicans into backing him to the last ditch. 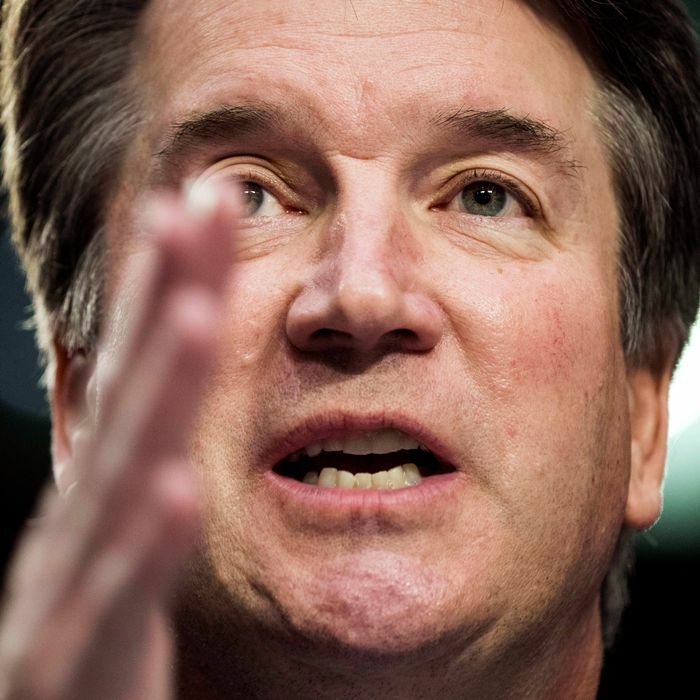 But if allegations proliferate or his accusers reinforce their credibility, he’s now in danger not just of losing a seat on the Supreme Court but his current lifetime appointment to the federal bench. And he’s definitely playing with fire in trying to undercut Trump’s freedom of action.